Traveling with dog or cat can make the family vacation more fun for everyone. 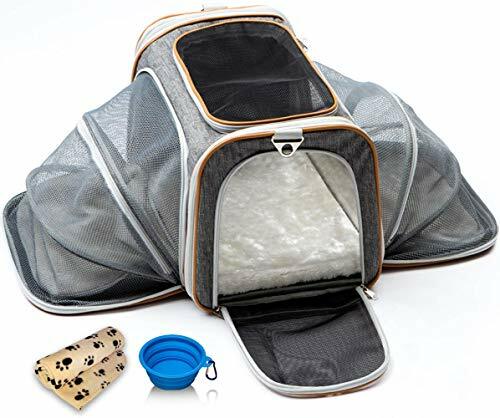 Our Soft Sided Expandable Travel Pet Carrier Airline Approved is a roomy travel kennel that lets you keep your small animal with you on airplanes, trains, car and in the family automobile. It is 100% Under Seat Approved Pet Carriers for Small Dogs & Cats. With its reinforced steel frame and bottom panel, your pet will enjoy taking in all the sights and experiences of travel, with all the comforts and reassurances of home and family. The carrier is portable and you will have easy access to your puppy or kitten through the top opening it\'s Airline Approved and features a 600D polyester exterior shell that wipes clean with a damp cloth. The Carrier is built for pets up to 14 lbs and measures 11 x 11 x 18 inches and 31 x 11 x 18 inch in expanded mode. The removable fleece insert is machine-washable, as is our free paw print blanket. With heavy-duty swivel thumb clips, you will never know the frustration of a twisted shoulder strap. Our collapsible pet bowl is made of non-toxic, dishwasher-safe silicone and has a carabiner clip for attaching to the D-ring on the carrier\'s shoulder strap. Our medium size carrier is made to fit below a plane seat. American airline, Delta, United and many more airlines welcome our carriers in their cabin on selected flights. There might be restrictions always check with your airline before flying. We offer a 1-Year Money-Back Guarantee for your peace of mind. In the unlikely event that our products do not meet your expectations, return them for a 100% refund of your purchase price. Transport your pet in the lap of luxury. Add our 3-Piece Air Travel Pet Carrier Bundle to your cart today. ✅ LUXURY TRAVEL FOR YOUR PET and more comfortable than rigid crates, our innovative Pet Carrier has expanding sides which zips out to give adult dogs and cats plenty of room. ✅ ELEGANT DESIGN & ENHANCED STABILITY from our reinforced steel frame. We promise that our crate won't collapse on your cat or dog! ✅ LIGHTWEIGHT & NO COLLAPSE. Petyellas carrier folds flat for easy storage. Its built for pets up to 11 lbs and measures 11 x 11 x 18 inches and 31 x 11 x 18 inch in expanded mode. Swivel clips prevent twisting of shoulder strap, and a leash clip inside the carrier secures your animal. ✅ BONUS ITEMS INCLUDED IN THE PACKAGE! Free fleece blanket, collapsible bowl, shoulder strap and padded faux bottom makes your beloved companion travel in total comfort. ✅ 1 YEAR MONEY BACK GUARANTEE! If you're not delighted with the quality of our Expandable Pet Carrier Set, return it for a 100% refund.No questions asked. View More In Crates, Houses & Pens. If you have any questions about this product by Petyella, contact us by completing and submitting the form below. If you are looking for a specif part number, please include it with your message.